Our wide range of Arctic Sea Market products are proudly made in Canada. They are sold in pre-cooked, frozen form, while still offering fresh surimi flavours. The products are all made from kamaboko, a special blend of refined white fish, with no added preservatives. We have many Arctic Sea Market products, including surimi crab, fried kamaboko, as well as pre-packaged kamaboko to put in oden. We invite you to try all our Arctic Sea Market products. Our Arctic Sea Market surimi crab is just as delicious as our Fresh Sea Market version, but is sold in a pre-cooked, frozen form to preserve the fresh surimi flavours longer. The product is available in leg and flake forms. 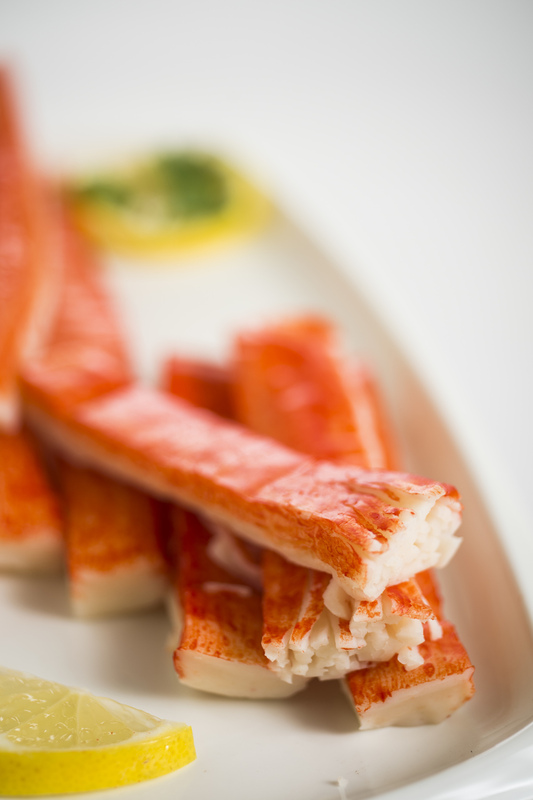 These delicious surimi crab legs are sophisticated alternatives for actual crab legs. Defrost and serve cold, or heat up the crab legs and serve them warm with a melted butter sauce. The flake-form surimi crab products are versatile and can be defrosted and served in sushi, salads, sandwiches and dips. Our Arctic Sea Market Fried products are sold in pre-cooked, frozen form to preserve the fresh surimi flavours longer. The products are lightly fried, providing a delicate taste while preserving the firm texture of high-quality kamaboko. The Arctic Sea Market fried products are available in Original flavour or Spicy Fish Cakes. Defrost and combine with noodles, vegetables and Ocean Food stir-fry sauce to make a healthy and satisfying meal. Oden is a traditional Japanese comfort food, especially on a cold winter day. Ocean Food’s frozen oden packages and gift sets offer the perfect blends of kamaboko for your oden. Each package is filled with a variety of frozen kamaboko, such as crab flakes, Naruto maki, fish balls and fish cakes. Boil your favourite soup stock, add daikon and the oden package. Within minutes, you’ll have a delicious and healthy steaming bowl of oden.